Imagine yourself relaxing on your expansive, mosaic marbled terrace, mesmerized by the stunning sky of today's unique sunset, gently sloping tropical mountains, and forever magnificent, blue Pacific Ocean. You could save 25% on last minute reservations. You could be watching the Pelicans and Cormorants fishing for dinner from your terrace. You could be cooling off at sunset, watching the daily unique sunset, taking a few steps to your private bar, adjoining your fully equipped kitchen to retrieve your favorite libation. We created this ultra deluxe suite with your dreams at heart, and then added a few more extra touches. Maid service 3 times per week, except Sunday. An on site concierge to help you with any and all requests. Casa Que Ve al Mar (our condominium site), located in Zihuatanejo, is midway up a gentle slope. Designed and built by Enrique Zozaya, the complex features 2 outdoor infinity swimming pools, lush landscaping, fabulous views over Zihua Bay, exercise room, reserved parking and 24 hour security. Tranquil, naturally beautiful, and convenient. 3 bedrooms and 2 full baths - two with king size beds and one with twin beds. Each suite can accommodate from 1 to 6 guests and is priced accordingly. I am native of buffalo new york and graduate of Columbia University NYC. My wife is from Mexico city and we met in Zihuatanejo where we immediately fell in love with this romantic city. I first came to Zih on a fishing trip in 1993 and immediately fell in love with this beautiful town. Since then we have been coming here 3 to 4 times a year and have never found a more beautiful and relaxing place. Once you are here relaxing on our beautiful deck watching the sunset you will experience the charm and ambience that zih has to offer. It's the best location in Zihuatanejo. We are near to the beach, The Tides, Casa que Canta, Interwest resort, and restaurants. The area is safe, and the views magnificent. We are close to the beach, a few blocks walk, 7 minutes..... We have two beautiful swimming pools. We have an oven, 4 a/c units, daily maid service........ You may have a real Mexican meal served in your condo. we have a free phone service to call back home to loved ones and friends. Towels, soap, shampoo, hair dryers, and a spectacular view of the ocean. 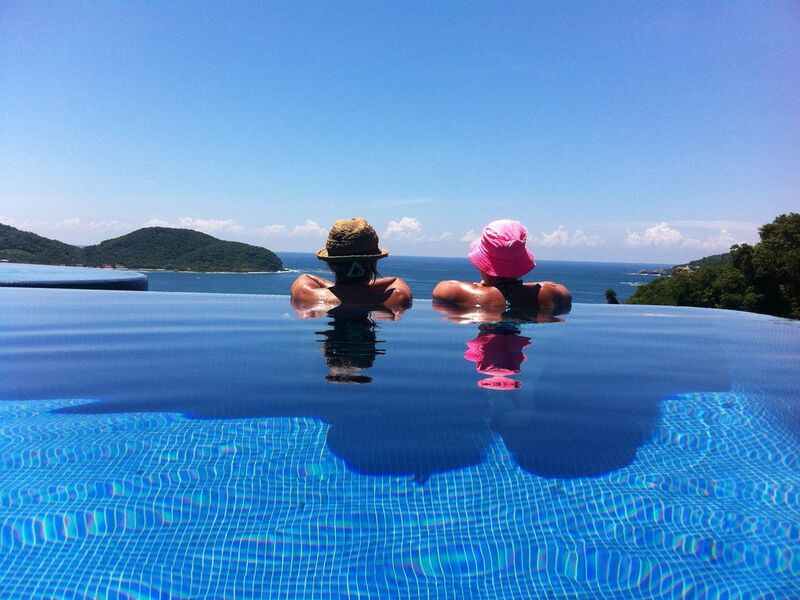 Fabulous views over Zihuatanejo Bay. Short walk to beach. No obstacles, just great views of the Bay and Ocean. Finest quality linens and towels, Beach towels included. beach towels provided for your convenience. Absolutely full kitchen includes oven, blender, juicer etc. Great 100% cotton sheets, luxurious fluffy towels. custom furniture, and bedding. The owners really put this place together very nicely, it's well designed and beautifully decorated.Because we used to be owners in the same building, we've seen many of the condos here and I have to say this is one of the best! Very comfortable and of course, a killer view! Very kind of you to let us know that we are trying to do our best, Thank you for choosing our unit. We very much enjoyed our stay. This is a very large unit with a terrific view. Loved the outdoor kitchen and large terrace and proximity to the pool. The rooms are a good size. Since there were only 2 of us, We did not use the media room, but it is very convenient to have an extra room if people need to have some “private” time or want to watch television. Only cons were one area of the terrace does not have a shade and the afternoon sun can be too strong to use the kitchen until after sun down. There was also a small leak in the second bathroom, which the owner addressed hiring multiple plumbers, etc. but unfortunately could not be resolved. I am sure he will have this fixed. The owner is very attentive. He also supplies all the filtered water. This may not seem a big issue, but given that it is so inexpensive, it surprises me that some of the other owners here do not supply the filtered water as a simple courtesy. The cleaning lady is superb! Claudia comes 3 times per week and is great. The unit is nicely decorated and well equipped for any needs. The electric orange juice squeezer was a joy to use instead of hand squeezing all those oranges. The walk down to the beach is easy. The uphill walk back a bit more difficult. This may seem strange to do for such a short distance, but many people just take a taxi, since it is only 50 pesos. Walking into town or to the Mercado was easy and fun and great exercise. We had a wonderful time and plan to be here again. Thank you so very much, Linda and I love to have such nice people as you visiting our lovely unit. We look forward to your return to paradise. From the moment we walked in, we were in complete awe. The views from the terrace are spectacular. At night you can hear the waves crashing against the rocks, we were very relaxed and really didn't want to leave. Everything was perfect and we have no complaints at all. Great Unit in a great complex! We really enjoyed our stay and the condo was great. We have stayed in Zihua a few times, and we both believe that this unit was the best one we stayed at. I am looking forward to our next trip back! Thank you so much. We would be delighted to receive you on your next vacation. As always Linda and I try our best to make your stay a memorable one. It is a beautiful house with great view, everything worked perfect. We really loved staying here and I definitely recommend it. It is important to know there are some steps (around 15) to get into the house but it is really lovely. Thank you so very much. We really enjoyed having you and look forward to your return. To say that our family enjoyed our stay at La Casa Que Ve Al Mar would be an understatement. We didn’t want to leave! We couldn't have been happier with the accommodations, location, amenities, and gorgeous view this property offers to its guests. The pool is so relaxing and the water crystal clear and odorless, the kids enjoyed it very much. The condo is furnished with everything you could think of needing when you are on vacation and even what you forget to bring; like the sewing kit, beach towels, soap, or pool toys. The maid service provided was the icing on the cake! The condo is so comfortable and beautifully designed. The staff on the property were always friendly and helpful. La Casa Que Ve Al Mar is the perfect location to explore and enjoy Zihuantanejo. It is centrally located; we walked to the beach and to town. Very convenient to catch a bus or taxi into town from the main road if you are incline to do so or the staff would call a taxi for you. All in all, we are extremely happy to have found La Casa Que Ve Al Mar and it will definitely be our first choice for a return visit.